The UK’s leading marine charity, says it hopes more people than ever before in Norfolk will take part in the Great British Beach Clean from September 15-18. 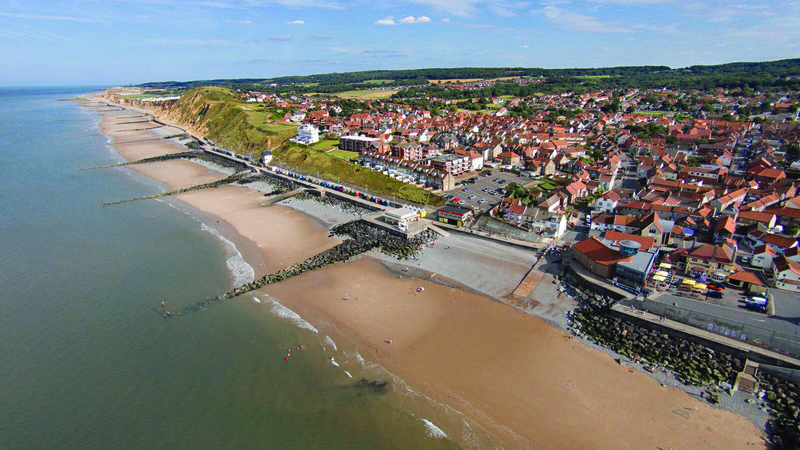 The event around the county’s coastline will help ensure some of the most beautiful beaches in the UK aren’t being taken for granted. The Marine Conservation Society (MCS) is running at least 11 beach cleans and surveys around Norfolk and so far just over 70 volunteers have signed up. The charity says it’s really helpful if people register their interest online before the event to ensure organisers have enough kit to go round! You can register right up until the very last minute www.mcsuk.org/waitrose, and of course you can just turn up on the day. The MCS beach clean event takes place every third weekend in September as part of the charity’s year round Beachwatch programme. Volunteers who get involved in Norfolk will be joining an army of beach cleaners not only around the UK, Channel Islands and the Isle of Man, but all over the world as part of the global International Coastal Clean-up, which takes a snap shot of beach litter across the planet on a single weekend. Each event only takes a couple of hours and, alongside the clean; 100 metres of beach are surveyed. The form is straightforward to complete, and helps MCS to add to the local and UK litter data picture, as well as the global view. Each clean-up has an organiser so there’s plenty of advice on the day on how to fill in the simple data sheets. This information will be used by MCS to work with governments and industry in the charity’s ongoing work to stop litter getting on to our beaches in the first place. To get involved in the Great British Beach Clean 2015 in Norfolk and be part of the most influential fight against marine litter in the UK visit www.mcsuk.org/waitrose You can also speak to the team on 01989 566017. This entry was posted in Cromer, Holt, Home Page, North Walsham, Sheringham and tagged beach, environment, marine conservation society, norfolk coast, rubbish on September 11, 2017 by Gay Webster. 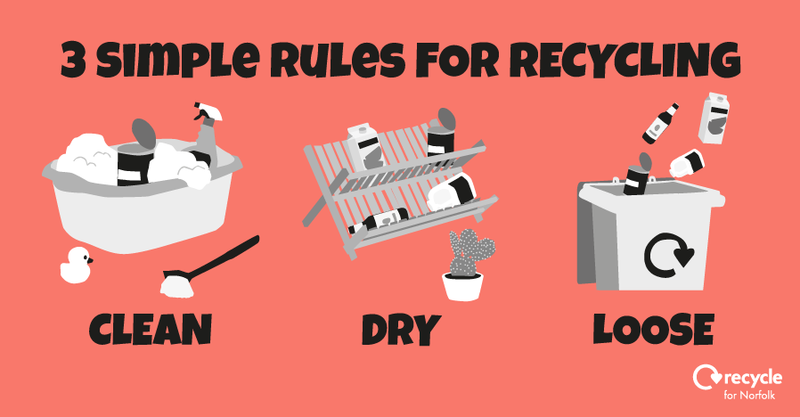 Give your recycling a little bit of love or in other words, make sure it’s clean, dry and don’t bag it when to goes into the recycling bin. 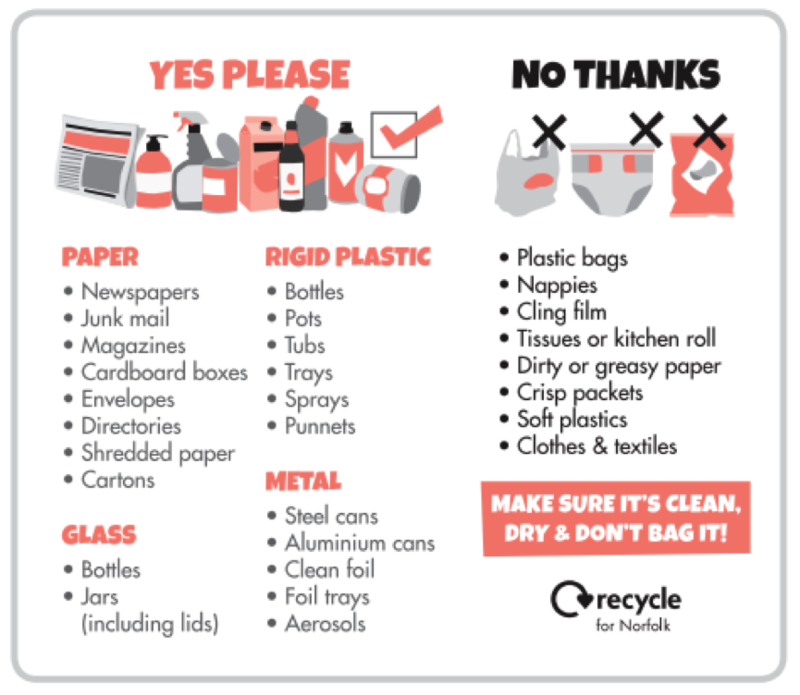 This is the message the Norfolk Waste Partnership wants residents to heed as part of a major push to Recycle for Norfolk in August and September. 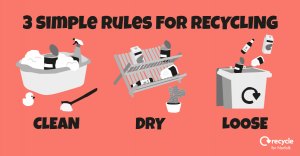 The revitalised recycling message comes in the wake of national research by the charity WRAP, which promotes the sustainable use of resources, that found overall, 64% of households’ dispose of one or more items incorrectly because of a lack of information about what and how to recycle. The campaign reinforces the rules in a leaflet which will go to every Norfolk home in September. Posters, radio, television adverts and online information will remind everyone how to recycle right. In 2015/16 Norfolk’s recycling rate was 45% which compares well to the published recycling rate for England as a whole which was 43%. There is also a cost when people don’t follow the rules on recycling. 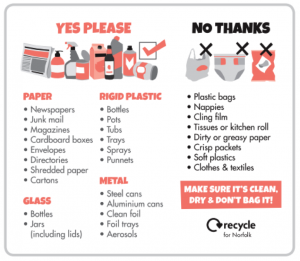 Whilst it is 33% cheaper to recycle one tonne of material than dispose of it as rubbish, last year Norfolk’s district, borough and city councils paid an additional £430,000 to have Norfolk’s recycling material cleaned-up before it could be made into new products. If everyone makes sure their recyclable materials are clean, dry and loose and that they are placed in the right bin, it will save money. This entry was posted in Aylsham, Cromer, Drayton & Taverham, Eaton & Cringleford, Hellesdon, Holt, Home Page, North Walsham, Sheringham, Sprowston, Wroxham and tagged environment, norfolk, recycling, wast on August 23, 2017 by Gay Webster. Are you a business which deals in renewable technology, green energy, environmentally friendly crafts or any other type of green activity? Or perhaps you run a farmers’ market stall, selling cakes, jams, chutneys and other tasty goods? Then Greenbuild – Celebrating Norfolk, North Norfolk District Council’s free-to-enter annual celebration of all things sustainable, may well be right up your street. 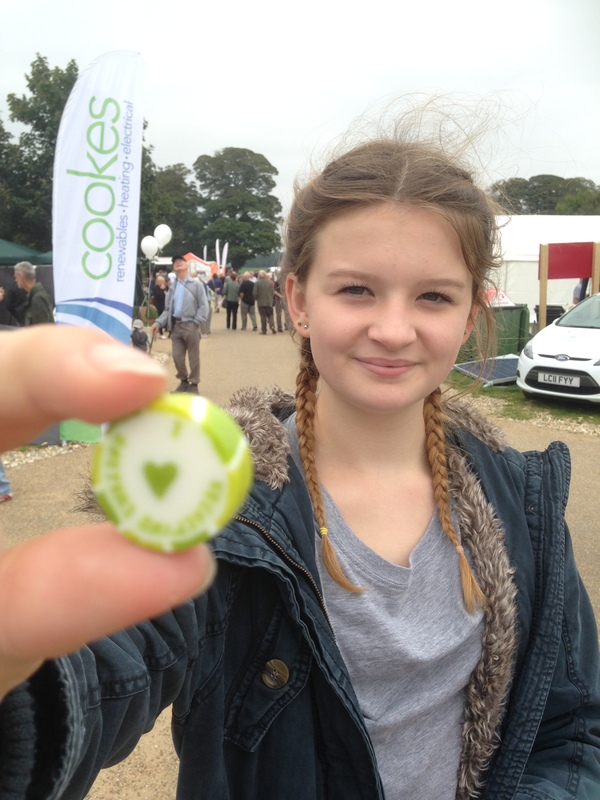 Greenbuild’s 13th outing will be at Felbrigg Hall, on September 9 and 10. It is designed to show people how to lead a greener lifestyle in an affordable and practical way. Parking and entry to Greenbuild are free. Opening times are 10.30am-4.30pm on the 9th and 10.30am-4pm on the 10th. 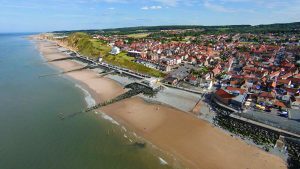 This entry was posted in Cromer Events, Holt, Home Page, North Walsham, Sheringham, Uncategorized and tagged compost, eco, environment, free, greenbuild, North Norfolk District Council on July 10, 2017 by Gay Webster.